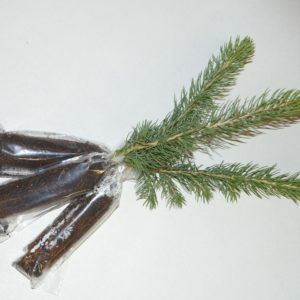 Go for unique impact with a tree seedling packaged in a clear, reusable tube with your choice of colored end caps. This packaging is Post Office approved to mail a tree directly to your customer without additional packaging. 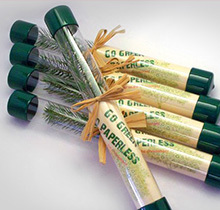 Your personalized insert is included on your choice of recycled paper, rolled and inserted along with planting instructions. The tube is approximately 1” in diameter and creates a microclimate in which the tree seedlings can survive for up to thirty days before being planted. Ribbons may be added for an additional cost. As a bonus, the plastic tubes and caps are recyclable. You can also save $0.75/tree if you choose to assemble them yourself. 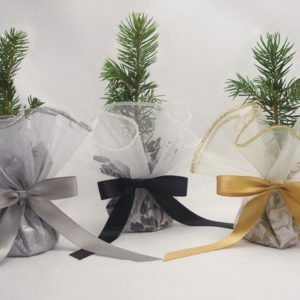 Mail-a-Tree makes a perfect tree wedding favor, for the bride and groom who want to gift sustainable, evergreen wedding favors. 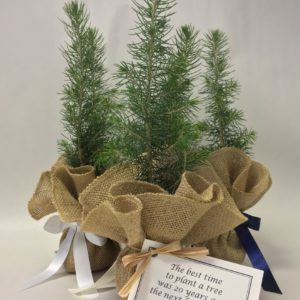 Meyer Spruce will be available on orders for delivery after August 1, 2018! Which species of tree do you want? Which border would you like for your insert? To have a picture or your logo printed on your insert, please email it to us at info@greenworldproject.net. 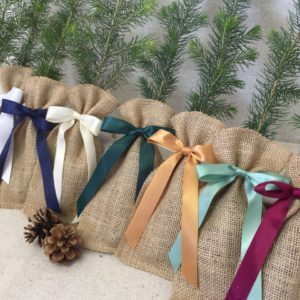 Which color ribbon do you want? To order more than 1500 trees, please call office for pricing at 800-825-5122. Fed Ex ground will require 4 days to reach your location. For a faster option, please call the office at 1-800-825-5122.